Noriko Yamaguchi (born 1983) graduated from the Kyoto University of Art And Design where she is currently doing a post-graduate course. She works with different forms of expression and various media, including performance, photography, video, sculpture and drawing. In 2004 was awarded the Panel of Judges Prize at the 21st Century Asia Design Competition, her photographs were also featured in the prestigious The Sovereign Asian Art Prize Competition (2008-2011). Yamaguchi exhibited in Kyoto, Tokyo, Paris and Taiwan, as well as during the 14th Media Art Biennale WRO 2012 Alternative Now where she presented the Pillow Talk #2 performance. Lives and works in Kyoto. Noriko Yamaguchi’s video animations, photographs, drawings and performances, rigorous in their form and composition, stem from intimate experiences, thoughts, and references to personal memories and cultural encounters. Her work concentrates on the human body and its relation to nature, tradition, social environment and technology. 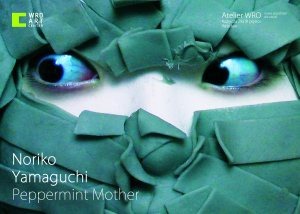 The exhibition at the WRO Atelier includes a sensual video triptych: Peppermint Mother (2007), Tsuchitaraschi (2010) and Rabbits (2011), works related to the process of its creation: the Jumping Drawings installation and specially edited short animation sequences, together with a video conversation led by a Japanese curator, Akiko Kasuya, held in May 2012 in artist’s studio in Kyoto – all the above making up Yamaguchi’s first solo exhibition outside of Asia. For Yamaguchi, the eponymous mother is a matrix in which human body and mind, manifested in a specific surrounding, blend together and create an autonomous entity. Mother is both – the mind and the body – as well as the space surrounding them from which we are all born and in which we reappear anew over and over again. (Polski) Noriko Yamaguchi (ur. 1983) jest absolwentką Kyoto University of Art and Design, na którym obecnie kontynuuje studia podyplomowe.